How much can the 2019 Ford Super Duty tow? Looking to upgrade to the most capable truck around? Then we’ve got you covered. Here at Crossroads Ford Lincoln, we provide drivers in the Frankfort area with powerful, heavy-duty trucks, and the most frequently sought after is the Ford F-Series. Now, if you’re in the market for a truly heavy-duty, highly-capable pickup, then the F-350 Super Duty is the way to go. It offers all of the hauling and towing capability that you could possibly need. It’s all thanks to the powerful engine at its core. 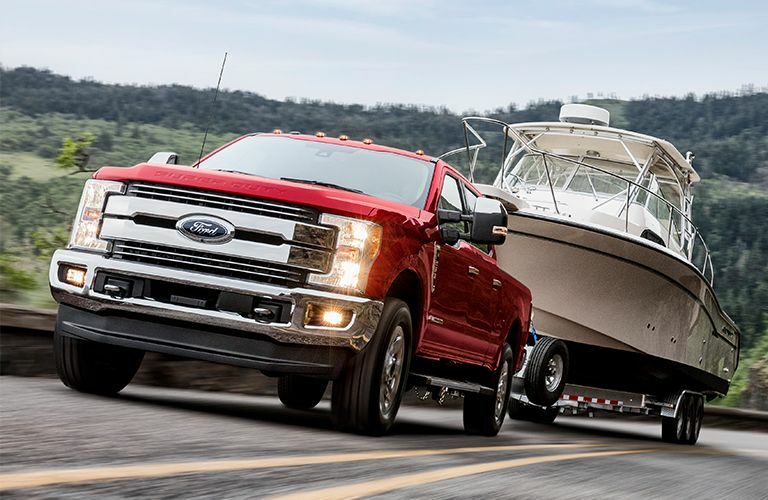 The 2019 Ford F-350 Super Duty, when properly equipped using a gooseneck hitch, can tow up to 32,000 pounds – a massive 16 tons. Whether you’re transporting equipment, materials, or even another vehicle, the F-350 can handle it with ease. Of course, every job won’t require you to tow a trailer. That’s where the 2019 Ford F-350 Super Duty’s Best in Class payload capacity comes in handy. When properly configured, this massive pickup truck is able to carry up to 7,640 lbs. – greater than any other pickup in its class! If you have any further questions about the 2019 Ford F-350 Super Duty and its availability in Frankfort, KY, don’t hesitate to contact us here at Crossroads Ford Lincoln. If you’re interested in getting behind the wheel of the new Ford Super Duty, be sure to check out the models currently available on our lot here in Frankfort! We have a selection of Super Duty models for you to choose from, which you can view on our online inventory list! From there, all you have to do is give us call, contact us online or visit our lot and we’ll be happy to set up an appointment for you to come by and take one of our trucks out for a test drive. That way, you can experience the incredible power of the Super Duty for yourself before deciding if it’s right for you!